He was the king of rock'n'roll, the singing sensation who showed us how to swing our hips and get to the rhythm. 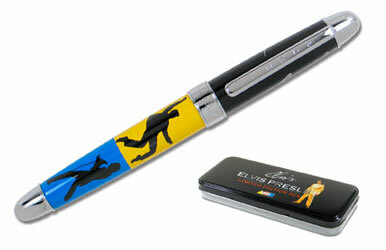 Let Elvis, our American icon, strut his stuff to celebrate your 50th in the form of this limited edition "On Stage" pen -- one of only 1,935 that have been produced in honor of the year of the King's birthday in 1935. Once the edition sells out, no others will be made. The pen is 5 3/8 inches long with the cap closed, chrome accents and the edition number engraved on the cap band. It uses roller ball components and Schmidt ink refills (one cartridge included) and is offered in an custom Elvis Presley metal presentation case. From Acme Studios.